In May 2009, Supreme Court Justice David Souter announced his intention to retire from the Supreme Court. Several weeks later, President Obama nominated Judge Sonia Sotomayor, who currently serves on the U.S. Court of Appeals for the Second Circuit, to fill his seat. To fulfill its constitutional “advice and consent” function, the Senate will consider Judge Sotomayor’s extensive record – compiled from years as a lawyer, prosecutor, district court judge, and appellate court judge – to better understand her legal approaches and judicial philosophy. 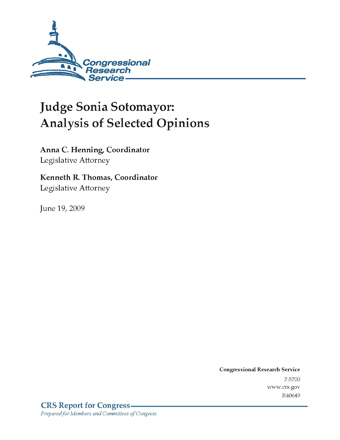 This report provides an analysis of selected opinions authored by Judge Sotomayor during her tenure as a judge on the Second Circuit. Discussions of the selected opinions are grouped according to various topics of legal significance. As a group, the opinions belie easy categorization along any ideological spectrum. However, it is possible to draw some conclusions regarding Judge Sotomayor’s judicial approach, both within some specific issue areas and in general. Perhaps the most consistent characteristic of Judge Sotomayor’s approach as an appellate judge has been an adherence to the doctrine of stare decisis, i.e., the upholding of past judicial precedents. Other characteristics appear to include what many would describe as a careful application of particular facts at issue in a case and a dislike for situations in which the court might be seen as oversteping its judicial role. The First Amendment of the Constitution provides that “Congress shall make no law … abridging the freedom of speech, or of the press…. ” Judge Sotomayor’s decisions interpreting this clause do not appear to be considered particularly controversial. To the extent that a pattern can be discerned, some might point to a meticulous recitation of the facts and her application of precedent from the Supreme Court or the Second Circuit to those facts. Consequently, it does not appear possible to discern a particular ideology from her opinions or to determine whether she would favor a more or less expansive application of the Free Speech Clause of the First Amendment. that the policy restricted its First Amendment right to communicate with foreign nongovernmental family planning organizations that fell under these prohibitions. Judge Sotomayor applied Second Circuit precedent that had dismissed a nearly identical challenge to the policy and found that the Mexico City policy did not prevent the CLRP from exercising its first amendment rights. On the other hand, in U.S. v. Quattrone, in another opinion authored by Judge Sotomayor, the Second Circuit overturned a gag rule placed upon the press by the district court. Sotomayor noted that the gag order was a prior restraint and that such speech suppression is among the least tolerated forms of suppression under the First Amendment. Applying Supreme Court precedentarticulated in Nebraska Press Association v. Stuart, Sotomayor held that the district court had not sufficiently justified the gag order and thus overturned it. Another case analyzing the constitutionality of a prior restraint was Doe v. Mukasey. Judge Sotomayor was part of a unanimous three-judge panel that declared portions of the USA PATRIOT Act unconstitutional. The case considered provisions of the act that prohibited recipients of national security letters (NSLs) from disclosing the fact that they had received the letters, an issue on which the Supreme Court has yet to speak directly. The panel, therefore, applied Supreme Court precedent related to prior restraints articulated in Freedman v. Maryland. The panel, however, appeared to do so with attention to Supreme Court decisions that indicate courts owe a higher degree of deference to the Executive Branch in matters of national security. In Freedman, the Supreme Court held that, in general, where an expression is conditioned on government permission, three procedural protections are needed to guard against impermissible censorship: (1) restraint prior to judicial review must be only for “a specified brief period”; (2) any further restraint prior to a final judicial determination must be limited to “the shortest fixed period compatible with sound judicial resolution”; and (3) the burden of going to court to suppress speech and the burden of proof in court must be placed on the government. The Second Circuit was able to construe most of the provisions at issue to avoid constitutional difficulties related to the first two requirements. However, the panel found that one of the provisions of the act contradicted Freedman’s third requirement regarding the burden of bringing an action. Another provision of the act treated certification on the part of government officials that the disclosure might endanger national security or interfere with diplomatic relations as conclusive evidence to sustain the government’s burden of proof. The panel held that a certification was not enough to meet the burden of proof standard set out in Freedman. The panel, therefore, partially invalidated the provisions at issue, but did not find the provisions to be unconstitutional in their entirety. Instead, the panel remanded the case to allow the government the opportunity to comply with the proper constitutional standards. In recent years, the Supreme Court has considered several cases involving national security. These cases have typically concerned the scope of executive authority in the conflict with Al Qaeda and the Taliban, as well as the rights owed to persons detained by the United States in the course of the conflict. Court rulings in this area have often been made by a five-justice majority. As a result, there has been significant interest in Judge Sotomayor’s views regarding national security. If she is confirmed, it is possible that she would cast a deciding vote in national security cases that come before the Supreme Court in the coming years. An examination of Judge Sotomayor’s opinions provides little guidance as to her judicial philosophy regarding executive authority in the realm of national security. During her tenure with the Second Circuit, Judge Sotomayor has heard only a handful of cases concerning national security matters. As will be discussed later, Judge Sotomayor wrote an opinion in 2006 for a unanimous three-judge panel in Cassidy v. Chertoff, holding that minimally intrusive, suspicionless searches of passengers’ carry-on baggage and automobile trunks before boarding a commuter ferry were justified on account of the government’s interest in deterring terrorist attacks on large vessels involved in mass transportation. Also, as discussed previously, Judge Sotomayor joined a unanimous three-judge opinion in 2008 striking down on First Amendment grounds two provisions of the USA PATRIOT Act relating to the disclosure of the receipt of National Security Letters. These cases, however, provide little indication as to how Judge Sotomayor might rule on broader national security issues relating to executive power or the detention of suspected terrorists. A case currently before an en banc panel of the Second Circuit may provide further guidance as to Judge Sotomayor’s views toward executive power on matters related to national security. The case of Arar v. Ashcroft concerns a civil suit filed by a dual citizen of Canada and Syria who was apprehended by U.S. immigration authorities during a flight layover at New York’s John F. Kennedy International Airport and thereafter removed to Syria. Arar brought suit against certain U.S. officials that he claims were responsible for transferring him to Syria, where he was allegedly tortured and interrogated, with the acquiescence of the United States, for suspected terrorist activities (Arar’s transfer has sometimes been characterized as an “extraordinary rendition”). In 2006, the U.S. District Court for the Eastern District of New York dismissed Arar’s civil case on a number of grounds, including that certain claims raised against U.S. officials implicated national security and foreign policy considerations, and assessing the propriety of those considerations was most appropriately reserved to Congress and the executive branch. A three-judge panel of the Court of Appeals for the Second Circuit upheld the lower court’s dismissal in 2008, but the circuit court subsequently agreed to rehear the case sitting en banc. Although the circuit court has heard oral arguments in the case, it has yet to issue a final decision. Presuming that Judge Sotomayor participates in the court’s final ruling, her decision may shed further light as to her views on judicial oversight regarding executive action in the field of national security.